The Cowboy Hat is a high-crowned, wide-brimmed hat and the classic attire of the North American cowboy. Today it is worn by many people, and in particular ranch workers in the United States, western Canada and northern Mexico, and also with Country and Western singers, and Rodeo riders. The Cowboy Hat is an iconic part of Old West cowboy lore. 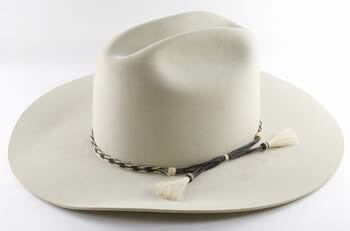 The shape of a cowboy hat’s crown and brim are often modified by the wearer for fashion and to protect against weather. The first western model was the open crowned ‘Boss of the plains‘, and after that came the front creased Carlsbad, destined to become ‘the’ cowboy style. The high crowned, wide brimmed, soft felt western hats that followed are intimately associated with the cowboy image.